This is my second Orient watch, and I must say, I am very pleased with it. It very obvious homage to the Rolex 16613, which is probably my favorite Rolex ever made. That being said, the real deal costs as much as a good used car. 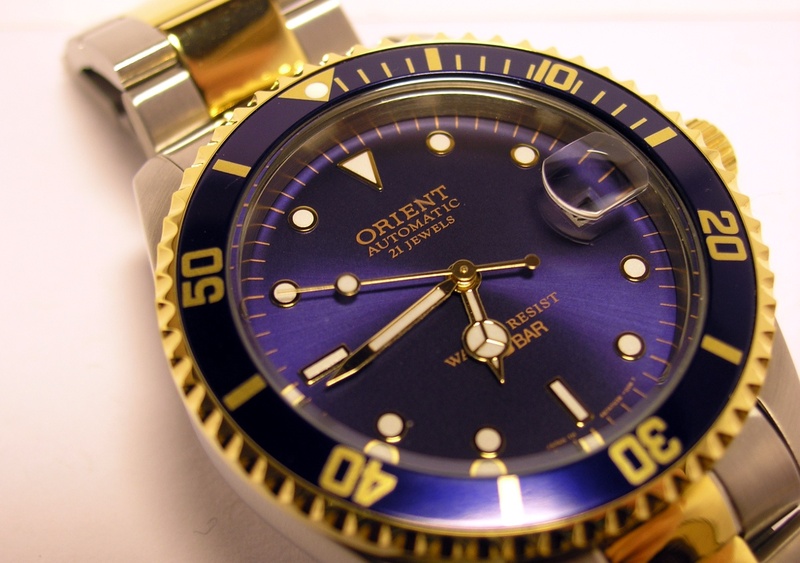 So, what do you do when you love the look of a watch, but hate the thought of buying a fake? 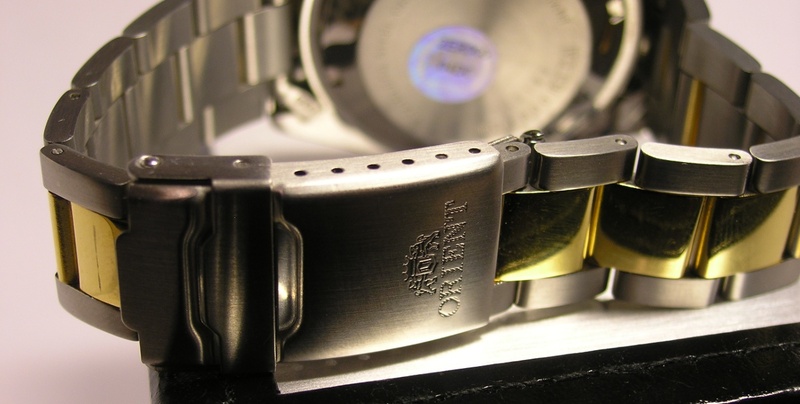 Get an homage from one of the most respected watch makers outside of Switzerland, Orient Japan. The case is solid stainless steel with a solid case back. The edges are crisp, but not scratch you sharp. The sides and bottom are buffed to a perfect mirror finish and the top is brushed. The overall workmanship is exceptional for a watch in this price point, around $110-$120. It is not an exceptionally heavy watch and wears easily. The crown is large and easy to grasp. It turns with ease and has a good 5 to 6 threads of engagement on the stem. I am really impressed how well the screw down crown works. It is buttery smooth to screw and unscrew and is probably the smoothest screw down crown I have ever experienced, at any price. The crown is unsigned. The bezel is a 60 click bezel is unidirectional and easy to turn. It clicks precisely to the 1 minute marks. There is very little sloppiness that is often seen of inexpensive pieces. Again, much better than would be expected for this price point. The gold plating is even and matches other parts of the watch. The face is a deep blue, with a hint of purple radial sunburst pattern that shifts and changes with lighting. 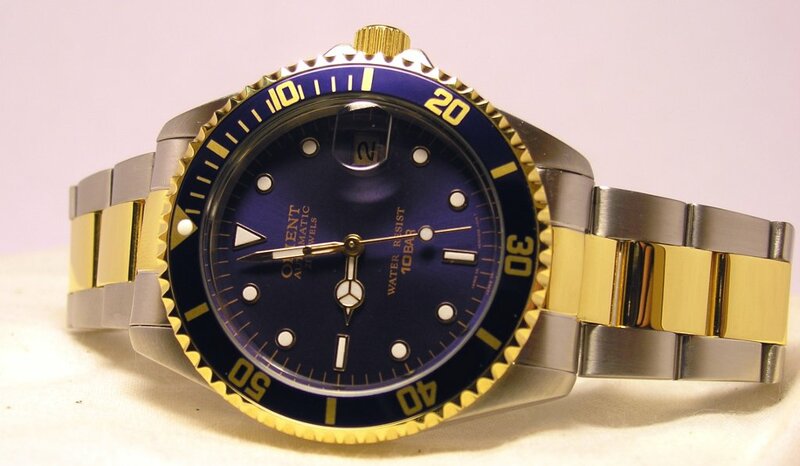 The markers are the classic Submariner style are have luminous paint applied. Under a 10X jeweler’s loupe, the face is flawless with no dust or debris. The luminous paint is evenly applied to each marker, perfectly on center. The gold plating is very consistent over the whole watch, with the markers, hands, bezel, crown, and band all the same yellow gold color. The lume is adequate, but not exceptional, on par with my Seiko 5’s, but not with my true divers. The date wheel has a silver/champagne look to better match the dial markers. The hands are also the classic submariner Mercedes style with even gold plating and lume. The second hand has a large lume pip. It is easy to time with a simple glance. The crystal is mineral glass with a very effective magnifier, which I would guess is 2X. The band is solid stainless steel with gold plating down the center of the links. It is well made, but a little light. There are no squeaks or rattles. The clasp is a simple flip over with safety lock. It is stamped with Orient and their two lion logo. There are 6 mirco adjustment holes, so an perfect fit is very easy. I had to remove 3 links for my wrist. I like a small feature, a little rubber retaining sleeve that holds in the spring pin for the micro adjustment holes. This particular spring pin just loves to get away from you on every other watch I own, so, thank you Orient for that little feature. The movement is an Orient 21 jewel, ER aka 487 movement. The movement automatically winds quickly and quietly. It sounds like it has a variation of the Magic Lever winding system, but is quieter than Seiko’s implementation. Accuracy is excellent so far, +1 second in 24 hours and +3 seconds in 72 hours! This exceeds COSC specifications, and probably my most accurate mechanical watch so far. Overall I am very happy with this watch. It has the look I really wanted, feels and looks great on the wrist. It is just a little flashy, but it really works. Case: 39.5mm diameter, stainless steel, 10ATM water resistance. 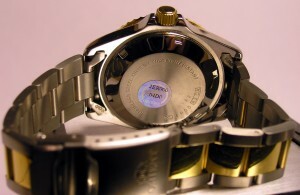 Back: Stainless Steel, screw down, Orient Hologram sticker. Crystal: Hardlex, flat with 2x cyclops magnifier over date. Movement: Automatic, ER00,487, Orient In house design and manufacture, Japan Made . Other: Solid, stainless steel bracelet with gold plating, 60 click Unidirectional Rotating Bezel, Screw Down Crown, Luminous Hands and Markers.